YOU MAY have already set foot on the soil of ancient Greece, and with your sword and sandals, fight wars overt and covert, and on more than a few fronts. For those still catching up, a journey to the heart of Ptolemaic Egypt awaits. This is Assassin's Creed Origins, a vast, sprawling, epic adventure, where you fight at the side of Caesar and become the personal bodyguard of Cleopatra, and at the some time, hunt down a ruthless organisation which has discovered something bewildering, yet, powerful, lying beneath the Pyramids at Giza. Assassin's Creed is arguably one of the most popular and successful series in gaming - and with good reason. It has, over ten major instalments, given us an iconic character in Ezio Auditore, transported us to richly detailed worlds which draw on a bedrock of sound historical understanding, and most importantly, in Assassin's Creed II and Black Flag, produced two of the most groundbreaking games of the last decade. While the Unity and Syndicate instalments of Assassin's Creed were tremendous fun, they can now be seen as dry runs for ideas more fully realised and expanded upon in Origins. Set in the Ptolemaic era (305BC - 30BC ), as that period draws to a close, Egypt had long been ruled by Greek descended Pharaohs, and is still not yet under the thumb of the rapidly expanding Roman Empire. This is Egypt at a crossroads, its finest days are long behind it, yet, as you wander through the game, you see its glories all around you - loving recreated in richj detail. It is striving to maintain it's independence through an ambitious young woman, who knows full well that many powers conspire against her. Setting the gameplay in this transition period allows Origins to indulge in the splendour of Ancient Egypt and the bustling cosmopolitanism of the Greco-Roman world, giving it a vast scope for presenting different cultures, settings, characters, and situations with which to interact, fight with/against, and delve into to find all kinds of 'Easter eggs'. In short, this is one of the most expansive open world games yet seen, with a seemingly endless array of side missions and challenges to keep a player occupied, not just for weeks, but (for a long-time Assassin's Creed nerd like me ) months. 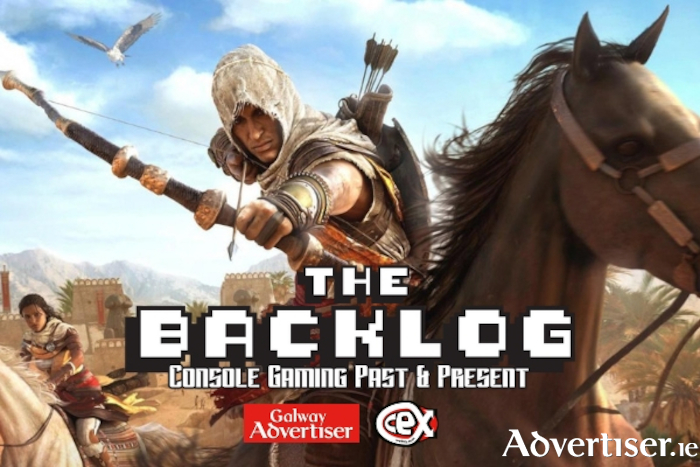 The adventure centres around a Medjay (Ancient Egyptian paramilitary police ) called Bayek, whose son is murdered by a mysterious cult. Seeking revenge on the men who carried this out, he finds himself unravelling a deeper plot, where the cult is seeking to use ancient, unearthly, technology to bend the fragile political situation in the Mediterranean to their will. Bayek's efforts to stop them will eventually lead to the creation of the assassin order. The story is well structured, taking in may aspects, such as the Roman Civil War - fighting alongside Julius Ceasar in a chariot that is permanently in danger of going out of control is quite the rush, as are the sea battles you get to command as Bayek's wife Aya - Cleopatra's rise to power, and the fading away of the old order as Roman influence becomes inescapable. Away from the main action, there is the fun of exploring deep into the pyramids, with enigmas to solve at the end of those passageways; a frissure in a remote, barren, region of desert where hallucinations and mirages confuse you as you approach; not to mention the glories of ancient Alexandra to wander through, and [plenty of fights to be hand on it's streets. The enemy AI, as ever in Assassin's Creed, remains inconsistent. Enemies are either oblivious to your existence or Bayek cannot move without a hoard of them descending upon him. Despite this, infiltrating the many forts dotted throughout is one of the game's most satisfying challenges. A great assistance is Senu, your eagle, who players can use to provide aerial reconnaissance. This intelligence gathering allows you to plan your attack carefully, and is a thrill for those of us who enjoy taking the strategic and stealth approach. Also vital are the gladiatorial combats. Often the most challenges combats within the game; these allow you to practise and hone your fighting skills and techniques, vital to have when taking on enemies in the wider world - especially the seven boss challenges, which will see Bayek and Aya beaten black and blue by some very stiff opponents. As for the Roman elephants and Egyptian gods you may occasionally have the opportunity to fight against? Well, if you can beat them, I take my hat off to you. These are the definition of 'challenging'! Origins offers a world of extraordinary architecture to wander through, a wide array of fights and adventures to undertake, all of it is a pleasure to lose yourself in. By all accounts these innovations have been further refined and advanced for Assassin's Creed Odyssey, whetting the appetite very nicely for that upcoming trip to Ancient Greece. CeX trade in all types of entertainment tech. One can trade in stuff for instant cash or for vouchers that can be put towards upgrades or whatever you like. Throughout the 2nd half of October and all of November they will be running a national promotion where one CeX customer will win €10,000 and 7 weekly winners will win €250 simply by trading in at our stores - the winner could be someone who trades in at CeX Galway!